Check out this video (5:11) on setting up request types. Request types Request types categorize Web Help Desk tickets. The request type specifies which users can create a specific type of ticket and what fields are included on the ticket. The following example defines the New Hire Paperwork request type. It is a subtype of the HR request type. This request type will be used to initiate the paperwork that the Human Resources department must complete when a new employee starts. Because tech groups have not been defined yet, this request type will be mapped to a tech group later. The Request Types window displays current request types. To create a nested request type, select the parent type. Optionally, click to copy values for the remaining fields from the parent type. 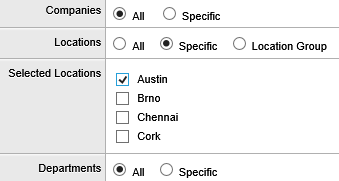 If the tech group is not defined, leave this field blank. You can map the request type to a tech group when you define the tech group. Specify whether this type of ticket is listed in the menu displayed to clients. Clear this option for types that are selected only by techs (for example, a request type used by techs to schedule an equipment maintenance window). Specify whether the user will be prompted to select an asset or model when they create this type of ticket. Optionally, restrict this ticket type to specific companies, locations, or departments. Only clients or techs associated with your selections will see this request type. For example, if the request type will be routed to a facilities maintenance group for a specific location, restrict the type to that location. Select the survey that is sent to clients when this type of ticket is closed, or select None to disable surveys for this ticket type.